Throughout history, women have been recognized for their achievements at a precise moment, but written off in the historical context. Although equal rights movements have prospered since the 20th century in the interdisciplinary division, female cartographers fall into this kind of invisibility. 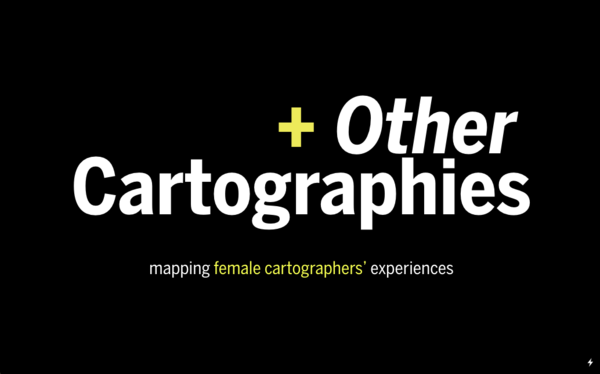 Many have written about the oblivion of women in different disciplines but this website highlights the contributions of women in the Cartography world. Cartography has been fundamental to understand the territory and the spaces within it. The fact that female cartographers’ work has been overshadowed by the Patriarchy has helped them formalize a new approach where subaltern groups are noticed and represented in the maps. This powerlessness gave women the courage to express geography in a different perspective; theirs.